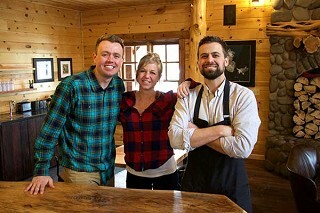 Major renovation at Sisters Coffee Co.
Justin, Jesse and Jared Durham are carrying on a family legacy. They didn't have a fire. They're not leaving town. All that yellow caution tape and unusual activity at Sisters Coffee Co. means that the Durham family is in the midst of a $295,000 renovation of their landmark business. The remodel will completely change the layout and traffic flow of the coffeehouse, and bring in state-of-the-art coffee- and espresso-making equipment. Their stated goal is "to design the most beautiful and efficient coffee house in Oregon." "Our hope is to offer an unparalleled coffee experience in Oregon," Jesse Durham told The Nugget. Jared, Jesse, Leigh-Anne and Justin Durham have worked together since last July to execute the project. Jared, Sisters Coffee Co.'s Director of Retail, was the project manager. The family nature of the project is in keeping with the whole history of the business, which opened in a tiny "coffee shack" on Hood Avenue in 1989. Winfield and Joy Durham launched the business and a second generation of Durhams has grown up in it. Winfield built the lodge-style building that currently houses the business in 2005. A significant aspect of the remodeling project is to honor Winfield and Joy's "legacy of hard work, integrity, and faith," Justin told The Nugget. Their names will be carved into the wood of the entry flooring. Justin told The Nugget that working on this extensive renovation has really brought home the scale of the undertaking that Winfield engaged in back in 2005. "We were just sitting on the balcony saying, 'How did dad do that?" Justin recalled. "They started something amazing and we've matured; we've grown up and we're professionals in the coffee industry," Leigh-Anne told The Nugget. As professionals in an ever-evolving industry, the Durhams recognized that they needed to make some changes to stay at the leading edge. Part of that had to do with changing the interior to cope with the high-volume of traffic the success of the coffeehouse has engendered. They surveyed customers - visitors and locals alike - and determined ways to "craft an outstanding coffee experience every day for every cowboy, quilter, visitor and hipster," as Justin put it. For example, many people, particularly locals, provided feedback that the shop was often too crowded to simply come in and grab a cup of coffee. "We listened and we've implemented a coffee bar so they can just come in and get a coffee," Justin said. That's only one element of a new floor-plan designed to promote efficient flow. Leigh-Anne noted that local craftsman Jim Newport has built a long, new custom table of Norfolk pine to provide extra seating - another element that customer surveys indicated needed enhancement. Even the bathrooms are getting an upgrade. Ultimately, of course, the "coffee experience" depends upon consistently crafting an excellent cup of espresso or coffee drink. To that end, the Durhams plunged into some serious field research. "We went to Seattle and toured... coffee places up and down the west coast," Leigh-Anne said. "We saw all the new technology. We got excited." Jared Durham took the lead on identifying the best equipment for the job. Sisters Coffee Co. is installing an in-couther, a Modbar pour-over system, the first of its kind in the region. "It allows you to program a recipe," Jared explained. "You can come in and order any number of our single-origins and have a specific recipe." That ensures quality and consistency. They are also installing a state-of-the-art La Marzocco Linea PB espresso station - again programmable, and exceptionally precise. "The espresso the customer is getting is going to be immaculate," Jesse Durham said. Leigh-Anne noted that producing the perfect cup is important to the Durhams - not only to please the customer, but also out of respect for the growers with whom they have developed significant relationships. "All the technology is pointing to honoring the farmers that grow the coffee," Leigh-Anne said. One such relationship is with the all-women's Nyampinga Co-op in southern Rwanda. "We're incorporating their coffee in our espresso blend," Jesse noted. Sisters Coffee Co. is also enhancing their food offerings, creating seasonal menus featuring locally grown products, such as potatoes grown by Rainshadow Organics. "We're trying to partner with our local vendors," Jesse said. Local contractors and trades-people are doing the remodel work. "Chuck Newport, along with project manager Charlie Patterson, woodworker Jim Newport and their entire team were the best contractor we could have ever asked for," Justin said. "They made our dreams a reality." Justin tapped someone with whom he's been buddies since the third grade for architecture services. "We worked with Jeff and Jenny Guggenheim of Guggenheim Studio," he said. "They also designed our Pearl District café (in Portland) and are long-time family friends." The family-and-community-based nature of the renovation reflects the core values of an organization that started about as tiny and local as you can get and grew into an international business that now employs some 70 people in Sisters and Portland. No matter how big they get, however, the Durhams remain committed to being a family business deeply rooted in the community they serve. "It's for the community," Justin said. "We're here for the people of Sisters." The newly renovated version of Sisters Coffee Co. expects to host a grand opening soon. Sisters Coffee Co. is located at 273 W. Hood Ave.